FW: Zaproot Nominated for Webby: PLEASE VOTE: DEADLINE…. As you might know, I produce a green webseries, called www.zaproot.com, (we call it sustainable comedy:) We’ve just been nominated for a Webby for best editing–which is a huge deal for our show. 5. Click Best Editing, the Second category. I am eternally grateful…hope you are well! Don’t start at the produce section. Only 1/2 the time are the end caps deals. buying produce in season. most nutritious, best price, when in season. Frozen fish? usually all frozen, , look at different parts. Seafood must be labled to reflect the country of origin, put in freezer on fishing boat. Lookin for fish with clear eyes and sking that’s soft to the touch. 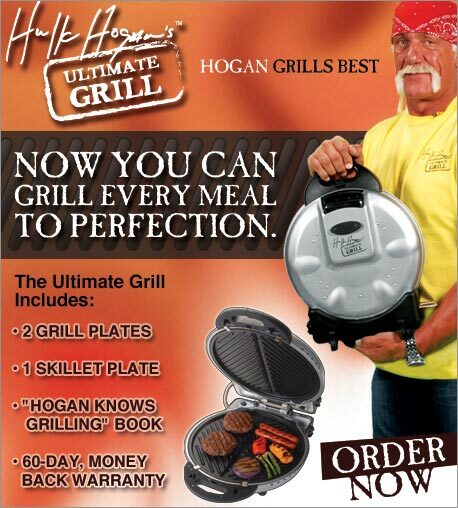 Hulk Hogan’s Ultimate Grill – Now you can grill every meal to perfection. Last day to buy–Friday, April 24, until Midnight! LAST CHANCE–BUY TODAY AND BEAT THE FINAL DEADLINE! All tickets, including the winners of the Early Bird Drawings and the Multi-Ticket Drawings, will be eligible for the Final and Grand Prize Drawings. This raffle benefits the Santa Barbara Contemporary Arts Forum (CAF), a non-profit organization that provides an arena for the presentation, documentation, and support of a broad variety of visual, media, and performing arts representing a wide range of attitudes. Committed to encouraging the creation and showing of new work of the highest quality, CAF promotes the work of local, regional, national, and international artists. CAF also aims to expand and educate the audience for contemporary art and to involve a diverse constituency. CAF seeks to promote critical awareness and stimulate challenging dialogue about aesthetic and social issues relevant to our time. In accordance with California Penal Code Section 320.5: (1), this web site is intended by the Santa Barbara Contemporary Arts Forum (CAF) to be an announcement of its raffle and is not intended to be an advertisement; (2) this raffle is not being advertised, operated, or conducted in any manner by CAF over the Internet; and (3) CAF is not selling, trading, or redeeming raffle tickets over the Internet. or as always ,000,000 cash. Call today to make sure you get through. Call to Enter Now! 866.944.2710 now a toll-free call. The Dangers of The Choking Game. Aquafina bottled water makes kids sick at La Mesa High School in Santa Clarita. Aquafina bottled by Coca Cola, Coke has pulled all the water from the school vending machines. Reports that the bottle was cloudy and may have contained bleach. The Annenberg Foundation has completed the million beach house located on the previous site of the Hearst Mansion. Apparently at some point you will be able to make reservations. April 25: A Great day at the beach. Everyone’s invited to an open house celebration of the Annenberg Community Beach House at Santa Monica State Beach, an event over a decade in the making. When. 10 am – 4 pm.First Splash performance by “O™” from Cirque du Soleil at 11. Or stop by on April 24 from 10 am – 4 pm for a sneak preview docent tour. No reservations or rsvps required. Ride your bike and use our free bike valet service. Power volleyball exhibition match, followed by volleyball and beach tennis clinics. / Kite flying, including an opportunity to make your own. / Majestic sand sculpture and demonstration. / Ballroom dance competition. / Special beachy session of Downbeat 720, followed by Lahula Polynesian dancing. / Synchronized siwmming. / Storytelling. / Santa Monica Conservancy docents. / Unveling of the 36 x 27 Stories of Santa Monica Beach photo exhibit. Walk along the bike path or take one of many footbridges from Palisades Park. Shuttle from the Civic Center Parking Structure (4th & Olympic, just off the 10 Freeway), running throughout the day from 10 am – 4:30 pm. It’s free and easy! Note: There will be no public parking on site on April 25. Foreclosures are the fastest growing sector of the real estate market. And, RealtyTrac is the #1 source for foreclosure data in the country. Consumers are interested in foreclosure information – an extremely hot topic that everyone is talking about – but you can rest assured that the content we provide is the most trusted, real-time dynamic data available. Enjoy seamless integration with the content we provide, enticing them to stay longer – and come back more often. percent from the fourth quarter of 2008 and 3 percent from February totals. With the foreclosure market gaining speed and the recent announcement that Fannie revised investment property guidelines by loosening its loan restrictions for real estate investors and second homebuyers last week. 159 U.S. housing units received a foreclosure filing during the quarter. totals were the highest monthly and quarterly totals since RealtyTrac began issuing its report in January 2005 despite a decrease in bank repossessions (REOs), which were down 13 percent from the fourth quarter of 2008 and 3 percent from February totals. RealtyTrac (www.realtytrac.com) is the leading online marketplace of foreclosure properties, with more than 1.5 million default, auction and bank-owned listings from over 2,200 U.S. counties, along with detailed property, loan and home sales data. Hosting more than 3 million unique monthly visitors, RealtyTrac provides innovative technology solutions and practical education resources to facilitate buying, selling and investing in real estate. RealtyTrac’s foreclosure data has also been used by the Federal Reserve, FBI, U.S. Senate Joint Economic Committee and Banking Committee, U.S. Treasury Department, and numerous state housing and banking departments to help evaluate foreclosure trends and address policy issues related to foreclosures. It’s a big season for foreclosures. And we’ve collected some stats and information that you’ll find very helpful. Read more about this in our press release or on our blog. Nevada continued to document the nation’s highest state foreclosure rate in the first quarter, with one in every 27 housing units receiving a foreclosure filing — more than five times the national average. Foreclosure filings were reported on 41,296 Nevada properties during the quarter, an increase of 19 percent from the previous quarter and an increase of nearly 111 percent from Q1 2008. Bank repossessions in Nevada were down 3 percent from the previous quarter, but defaults increased 27 percent and auction sale notices increased 35 percent. California posted the nation’s third highest state foreclosure rate, with one in every 58 housing units receiving a foreclosure filing. Other states with foreclosure rates ranking among the top 10 in the first quarter were Florida, Illinois, Michigan, Georgia, Idaho, Utah and Oregon. for nearly 29 percent of the nation’s total. The state’s foreclosure activity increased 35 percent from the previous quarter and 36 percent from Q1 2008, and the first-quarter total was state’s highest quarterly total since RealtyTrac began issuing its report in the first quarter of 2005.
filing in the first quarter of 2009, the fourth highest total among the states. a foreclosure filing, the state’s foreclosure rate also ranked fifth highest among the states. Rounding out the states with the 10 highest foreclosure activity totals in Q1 2009 were Michigan, Ohio, Georgia, Texas and Virginia. LOS ANGELES (AFP) — The British electronic music trio Depeche Mode will likely bring Hollywood Boulevard traffic to a halt Thursday when they hold a free street concert, a city official has confirmed. Tens of thousands of people are expected to cram the famed intersection of Hollywood and Vine Street, in the historical film district, to attend the launch of Depeche Mode’s new “Sounds of the Universe” album, their 12th since 1981. Winner of the best new product of the year! Carry Furnishings Easier! Straps that employ leverage which make everything you carry feel 50% lighter! Terrible accident down the street from where I live on Orange Grove in Pasadena. The speed limit is 40mph which is way to fast for a residential area. City officials in Pasadena need to pay closer attention to how fast cars drive on this stretch of city streets. Here’s the latest accident to take place. Several months ago there was a horrible accident involving a motorcycle at high speeds. John Dabiri, assistant professor of aeronautics and bioengineering at Caltech, will describe how his biology-inspired approach to engineering has placed jellyfish at the center of efforts to build next-generation underwater vehicles, design more versatile onshore wind power, and even to diagnose heart failure. Information: https://events.caltech.edu/events/event-5527.html. Jellyfish are the oldest, simplest, and arguably most successful species of swimming animal in the world. Yet they are primarily considered a nuisance on beaches or, at best, an attraction for aquarium-goers. Dabiri will describe how a biology-inspired approach to engineering has placed jellyfish at the center of efforts to build next-generation underwater vehicles, design more versatile onshore wind power, and even to diagnose heart failure. In the process, he takes engineering measurement techniques underwater, using SCUBA diving methods to study jellyfish and other fish species in their natural environment. This lecture is the Richard C. Biedebach Memorial Lecture. Full charge 110 outlet – overnight takes 6 hours to charge, can go 30 miles. Peter Arnel CEO- Fargo North Dakato. 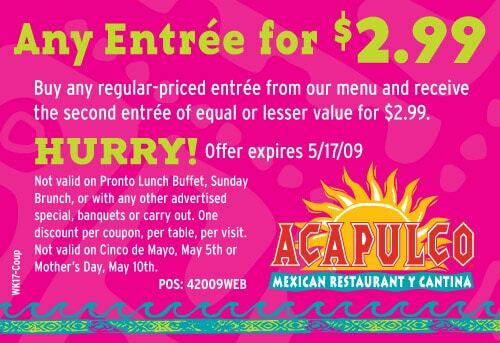 For those looking to save a few dollars when dining out check out the Acapulco $2.99 meal coupon below. This coupon expires May 17, 2009. Search on the blog for a newer version if you happen to land here after May 17, 2009. You can use this link also to print a larger size coupon. Just print it out and take it when you dine at any of the Acapulco restaurant locations around Southern California. The Natural Marketplace 2009 is taking place July 9-11 at the Sands Expo and Convention Center. If You are in the Business of Natural and Organic Products, Your Business Is at Natural MarketPlace 2009. Natural Marketplace 2009—the longest-running natural products trade show and official show of the Natural Products Association—is the place to meet your business needs. Find 400 exhibits filled with the latest natural products and services alongside special events, activities, and a highly rated education program featuring Keynote Speaker Hank Cardello, Senator Tom Harkin, and the all-day Retail Intensive. Natural MarketPlace is a powerful selling, networking, and educational opportunity. Source new products, build industry relationships, and connect with more than 4,500 colleagues. It’s Earth Day 2009! We’ve come a long way since Earth Day began in 1970. Congratulate yourself and join us for a day filled with fun and excitement! Join us in the morning and we’ll be giving away a free tree to the first 100 customers who spend $25 or more! (While supplies last). Join us in the evening from 4pm to 8pm as we invite our favorite vendors to provide free samples and giveaways. We’re planning a Planting Party (while supplies last!) We’ll also be launching our new recycling center, new containers for battery and light bulb recycling, and exploring transportation alternatives. I have something very special for you that I KNOW can seriously improve your internet business. Best of all I’m offering it here today for FREE! This is a very new Twitter e-book and was only launched on Twitter a couple of days ago and is being downloaded like crazy! Like may people before me I too was very wary of Twitter, but I am personally amazed by the amount of traffic that it has generated for me. Just by one very simple update I can add 100 new subscribers to my free ezine. Could you honestly say for yourself that for the very same amount of time you could do the same elsewhere? The same can be said for sales from just one update I have added hundreds and hundreds of pounds to my PayPal Balance. With this FREE E-Book that also comes with Master Resale Rights I will put you through your paces with everything you possibly need to know and exactly how I did it whether your a beginner or not. Remember if you look around Twitter you will find many with over 10,000 followers but how many will you be able to find that has only been on there 8 weeks? Twitter is the darling of the Web2.0 Social Networking revolution. Many people don’t get how a 140 character micro blog can be of any value, let alone see a way to make Twitter work for business and actually earn an income. 3. gained a reputation in the Twitter community of being a giver of knowledge support and encouragement. Sam and I had a challenge to get to 5000 followers which I just pipped her to. Jokingly I said, see who gets to 10,000 first and in under 100 days and Sam “streeted it in”. I am on target but even my “superior” resources and experience were no match for the Queen of Twitter, a young woman living her dream life with husband Dominic. Everything step is clearly set out, each tactic is explained and a road map for you to follow is there for you to replicate. Sam even has how to plan your day to maximize your efforts. and I can tell you Sam’s book has some quite amazing strategies that I wasn’ t able to access ANYWHERE ELSE on the internet.